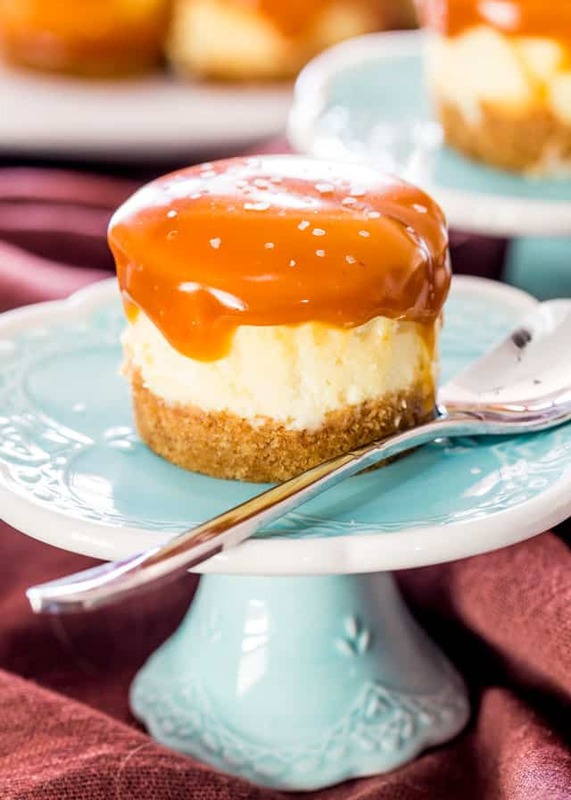 These Mini Salted Caramel Cheesecakes are creamy bite-sized cheesecakes with a graham cracker crust and topped with a delicious salted caramel. The perfect bite for any occasion! My obsession for mini cheesecakes knows no bounds. They truly are the perfect bite. Cheesecake truly is my favorite dessert and I never give up trying different cheesecake recipes. This recipe for mini cheesecakes is fool proof, no water bath required and very versatile. A few weeks ago while I was shopping in Canmore I found this jar of salted caramel sauce in one my favorite little stores there. I knew then that I had to make something special to use it on. The bottom crust is a very simple crust made with graham crackers, brown sugar and butter. It’s my favorite way to make crust for cheesecakes. It’s easy and quick. 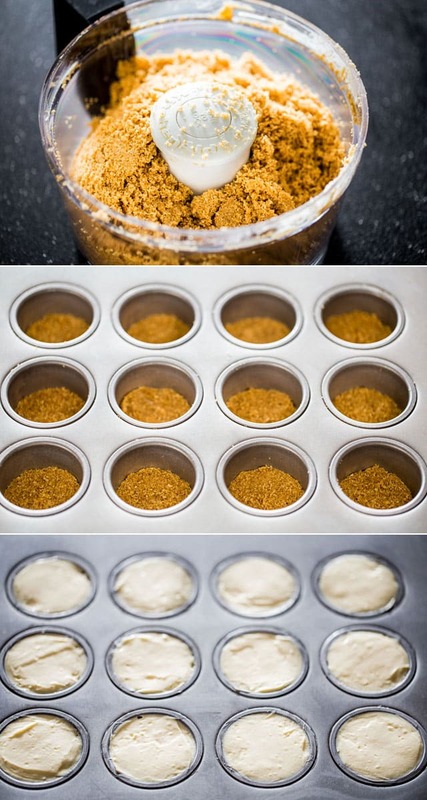 Pat the mixture into the individual cheesecake cups. If you don’t have this mini cheesecake pan, you can use a mini muffin pan. The cheesecake itself is my recipe I use all the time for cheesecake, I just adjusted the quantities. The main ingredients in cheesecake are lots of cream cheese, sugar, flour, vanilla, sour cream and eggs. Add them all to your mixer and mix until smooth. If your cheesecake top cracks like mine, don’t worry about it, you’ll cover it up with the salted caramel and nobody will know. However, be sure to read my notes on “How to keep your cheesecake from cracking” if you’re a perfectionist and want perfect little mini cheesecakes. 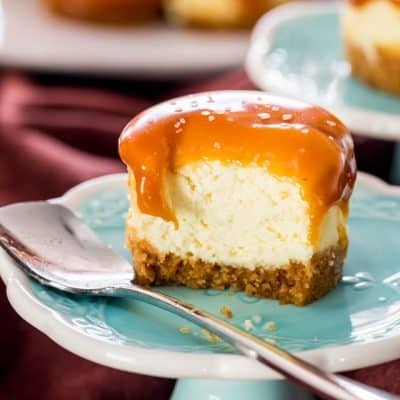 I would let the cheesecakes cool completely before topping them with the salted caramel, otherwise the caramel might melt too much. If it melts too much, I’m ok with that, I love it when it gets all gooey. I then sprinkled them with a bit more kosher salt. I really love the salt and sweet combination here. These are the perfect dessert, they literally are 2 bites each, or one big bite, depends how hungry you are. They’re perfect for any special occasion but if you’re like me you’ll make these on a Wednesday afternoon, just because you’re craving cheesecake. I prefer using Philadelphia cream cheese because it always makes a super silky cheesecake. However, if you can’t find the Philadelphia brand, use a cream cheese that is full fat. 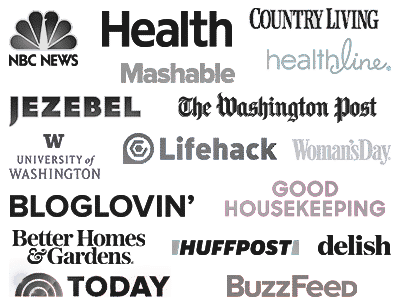 Do not use fat free or light cream cheese. In a food processor add the crushed graham crackers, brown sugar and melted butter. Pulse a few times until fine crumbs form. Pat mixture into ungreased mini cheesecake pan in each individual cup. Add the cream cheese, sugar to the bowl of your mixer and mix until smooth. Add the sour cream, eggs, flour and salt to the mixer and mix until well combined and smooth. Add about 2 to 3 tbsp of the cream cheese mixture to each cup. The mini cheesecake pan has 12 cups, there will be crumbs and cheesecake mixture left over for another 6 mini cakes, so if you only have one pan, refrigerate the crust and cheesecake mixture until the pan is free to continue. Bake the cheesecakes for about 15 to 20 minutes. Let the cheesecakes cool and come to room temperature. Melt the salted caramel in the microwave until you can spoon it out. Top each cheesecake with about 1 tbsp of the salted caramel then sprinkle with a bit of kosher salt. 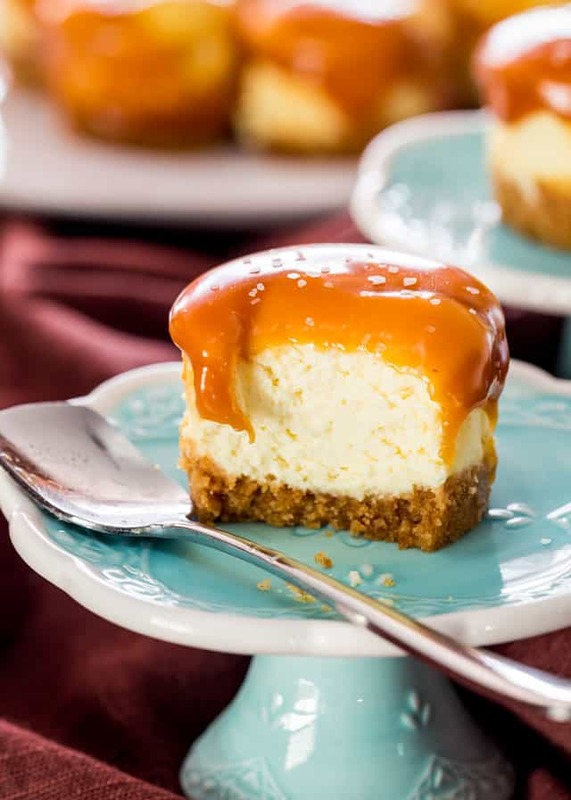 Make sure to let the cheesecakes cool completely before topping them with caramel to avoid melting. If you don't have a mini cheesecake pan, you can use a mini muffin tin with cupcake papers. Thanks for the tip on looking for salted caramels in a jar. I would not have thought to look for jarred ones. Hopefully, I will have success in finding them next time I am shopping. The pan is only for 12 yet your recipe yields 18. Would you please adjust your ingredients for 12 (or offer ideas for leftover)? Can’t wait to make. I ordered the pan from Amazon. You can adjust the ingredients by hovering your cursor over the number of servings. A sliding bar will pop up and you can lower or raise it to suit how many you’d like to make! I had enough cheesecake to fill 18 mini cups, I filled them to just below the rim about 2 tablespoons. They will deflate some when cooled. My biggest complaint, after using a highly rounded teaspoon of the crust, I had 2 Cups leftover!!! I would also highly recommend putting a pan below the oven rack to catch the butter that leaks. I think you should make the necessary adjustments to reduce the amount of the crust material. Tastes great! If you’re thinking more cheesecake these Pumpkin Cheesecake Brownies were incredible! I made these tonight & they came out amazing! Thanks for the recipe. Had leftover graham cracker crust so I will use it for a dessert for Thanksgiving. Happy Thanksgiving! How long can I keep it and it still will be good? I want to make them Friday evening for Monday. Is it ok? Or should I do them the day before I want to serve them? I am looking forward to try your recipe for the mini salted caramel cupcakes. I also love the little blue plates/standards on which you serve the mini cheesecakes. Can I buy these somewhere on the internet? Thank you for your answer in advance! Not sure, but I bought them at Pier 1 Imports. Where in Canmore did you find the salted caramel? I am on my way there next week! It’s called the Mountain Mercato! I love it! Can I make a regular cheesecake out of this instead of going for mini cheesecakes? Absolutely, but you might have to adjust quantities. I made these this weekend and they are adorable. I don’t have the mini tart pans and have way too many specialty pans and limited storage. I used jumbo foil cupcake papers to line my muffin tins. When completly cooled they came off easily. The sides were straight up and down and had attractive ridges. I learned not to put the Carmel on top until just before you serve them as it melts off the top. Also, I used flake salt, Maldonado sea salt for a little more impact. I used graham cracker crumbs and made half the recipe for a pie crust on the package. You can mix with a fork and avoid the processor step. Where did you buy the mini cheesecake pans? 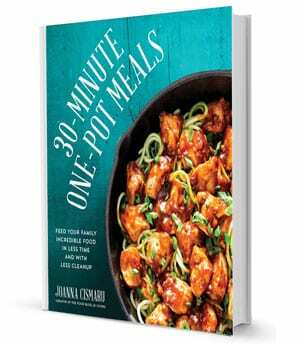 From amazon, there is a link to it below the recipe. Are they easy to get out of the pan, once refrigerated of course ? Doesn’t appear you used liners so I am wondering a way to release them without a mess. The bottom of the cheesecake cups comes up so you just push it up from the bottom, very easy to release without any mess at all. 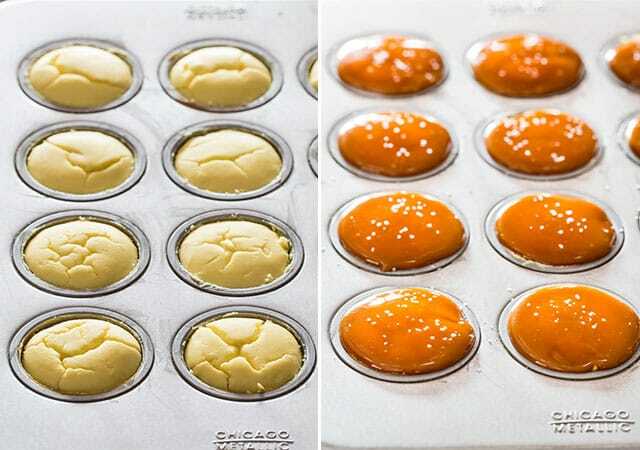 Hi.. would love to try these out but just wondering are they easy to slip out of the baking tray? I would be using the normal cupcake/muffin tray. Or do I need to line them? Thanks. It will definitely be easier if you line them with something in that type of pan! Where in Canmore did you find this ? Any place in Calgary? OMG I can’t think of the name of it but it’s like a little Italian grocery store with a patio in front where you can also order some great food! I don’t find caramel sauce here, but I’m not averse to making it–not that hard. But I hadn’t yet considered the possibilities of cheesecake with salted caramel sauce. Possibilities that leave my mouth watering. This is a saver. Bookmarked!